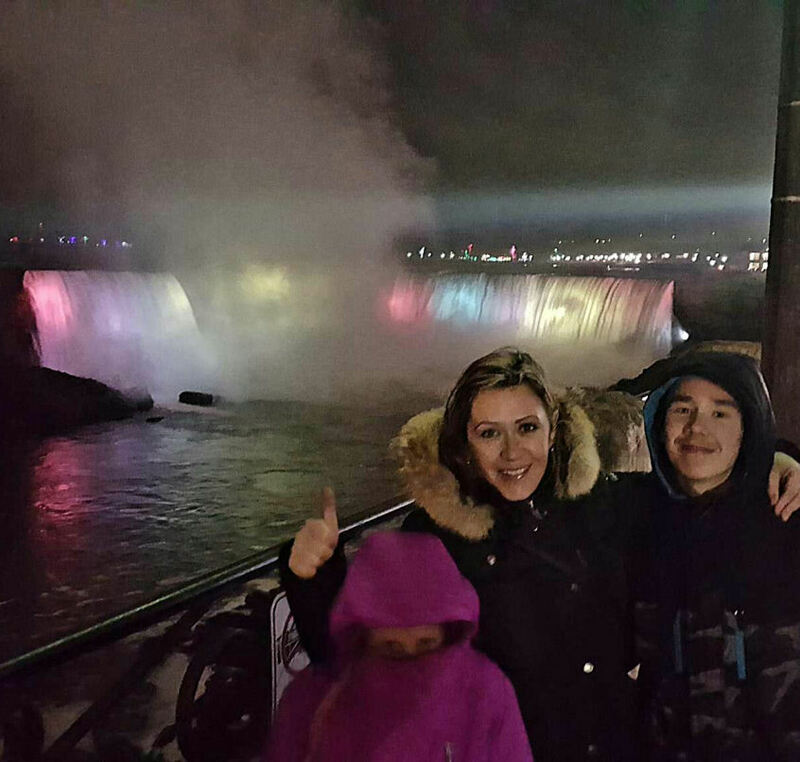 We arrived to Niagara Falls on New Years Eve EVE. It took us almost 8 hours to drive up there from New York City. Wow it is almost like flying time to Europe from NYC by plane. 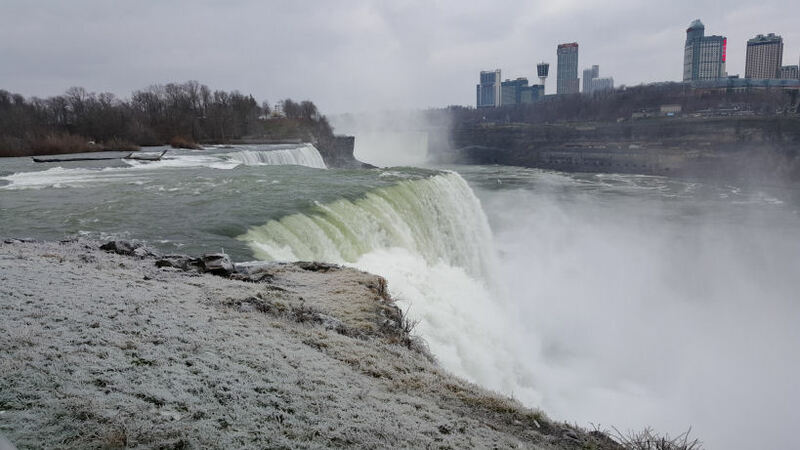 By this time of the year the falls should have been frozen, but because we had a very mild fall and a month of December and by mild I mean the whole December was like 60 to 70 Degrees, the cold temps hit the Niagara Falls only on January 1st 2016. It was a good decision to spend NYE elsewhere. Overall it is a great trip at any time of the year. This is actually our third time at Niagara Falls. Ever since I could remember my family and I have been spending New Years Eve at home with friends and family. Once in the past 13 years we went to a party that was hosted at one of our close friends home. This year we thought why not mix it up a bit and celebrate the New Year in another city. Despite being a 7-hour drive away we decided that we would head up to Niagara Falls, Canada. Checking the weather in advance I found out that it wasn’t going to be that much colder than NYC so we figured why not. 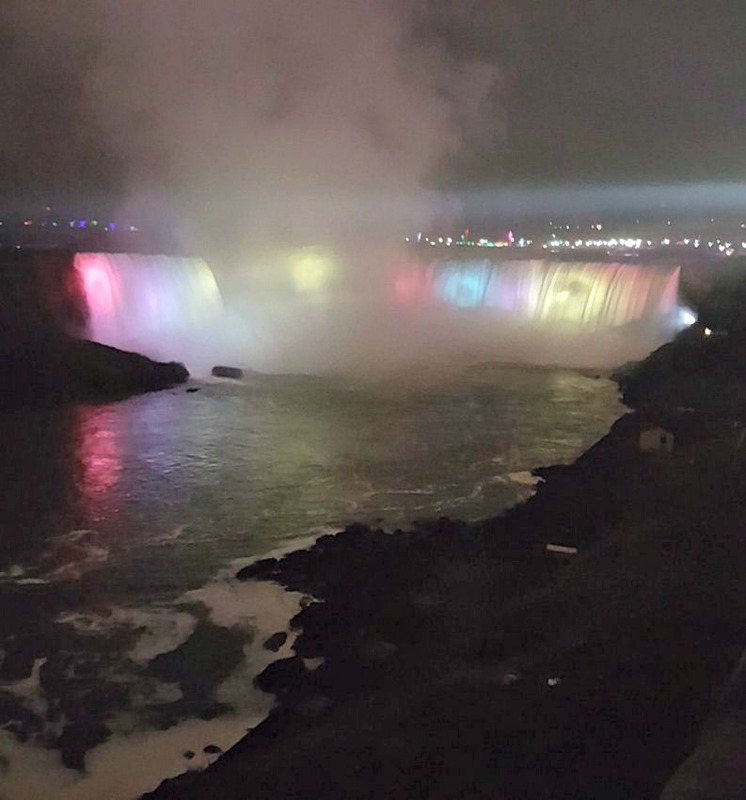 Even though it was a only a week before New Years Eve my husband was able to find a reasonably priced hotel that was about a 15 minute walk from the falls. He found us a room for two nights beginning the day before New Years Eve. Being that the drive from NYC takes so long we wanted to get up to the falls a day early so we weren’t dead tired on New Years Eve. He also found an excellent hotel to stay on New Years Day that way we didn’t have to drive home and could spend extra time exploring the falls. We left NYC at around 11:00am and arrived at the border crossing at 6:30 pm. The biggest traffic we hit was driving through Manhattan. This must have taken us about an hour. So if you have a way to avoid going through Manhattan I would recommend it. Our route then took us through New Jersey, Pennsylvania, New York and then finally to Canada. Once we were out of the city there was pretty much no traffic until we hit the border. Plan on making a couple of pit stops for bathroom breaks along the way. To save time and money pack snacks and drinks especially if you’re traveling with kids. Also don’t forget to pack your passports otherwise you wont be able to cross the border. The only tip I have for speeding up the border crossing is to have your passports open to the picture page before handing them to the customs agent. 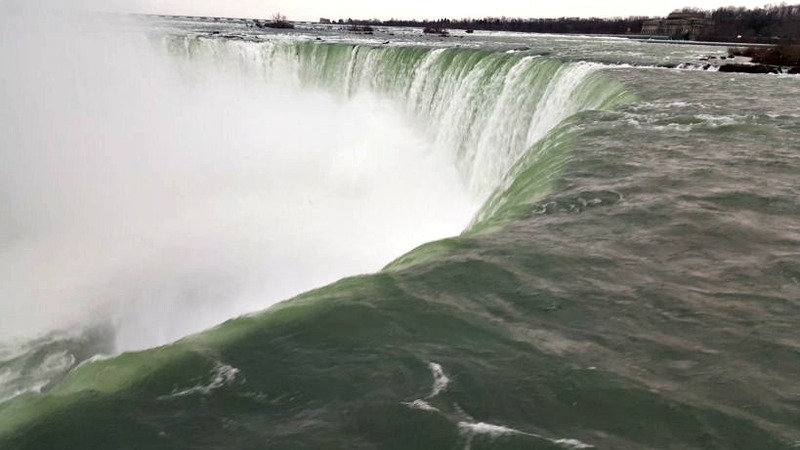 I highly recommend staying on the Canadian side of Niagara Falls. First off the Canadian side has many more things to do when compared to the U.S. side. Secondly the exchange rate favors the American dollar so your money goes a bit further in Canada. The first two nights we stayed at the Ramada Hotel Falls view in Canada. Don’t let the name fool you! This hotel does not have a view of the falls. The room was pretty good. It had two queen beds and was well maintained. Our only complaint about the room was that the sheets were too small for the bed and kept coming off the mattress. The staff at the hotel was friendly and the pool was nice but could have been a little bit warmer. Our major gripe with this hotel was the lack of free breakfast. The other complaint we had was that they charged a daily parking fee. I could understand if the hotel was in an area where space was an issue but this place had a pretty large open parking lot. look at this volume of water! 150,000 U.S. Gallons / 567,811 Liters per second! The hotel did have an IHOP located in the lobby and they gave us $10 dollar off vouchers. However we noticed that they jacked up the prices at the IHOP so we decided to eat elsewhere. My husband found a great place that was recommended online called The Flying Saucer Restaurant. The restaurant (it is actually a diner type) is in the shape of a flying saucer and about a 5-minute car ride from the falls. It is a really cool looking place with a flying saucer theme. If you have a chance to go there I would highly recommend the E.T. Special. It is a great deal at $8.99 Canadian and it is loaded with breakfast goodies. We liked the breakfast at the Flying Saucer Restaurant so much we decided to eat there two days in a row. 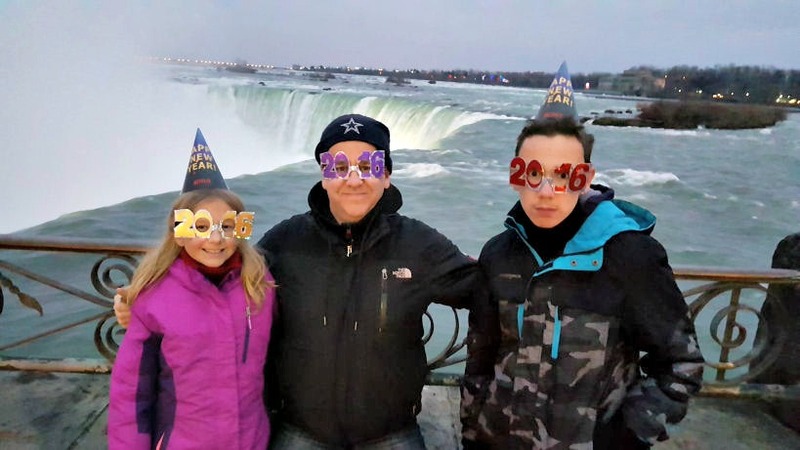 Our second day at Niagara Falls was New Years Eve. 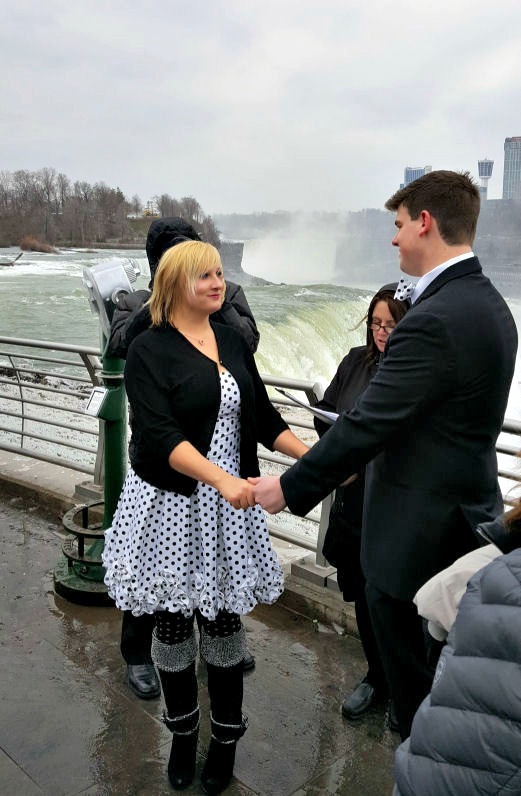 We had the opportunity to check out the falls during the day and see them setting up for the celebrations. Even though it was a little chilly it didn’t take away from seeing the amazing Niagara Falls. From the Canadian side you can view both the American and Canadian Falls. 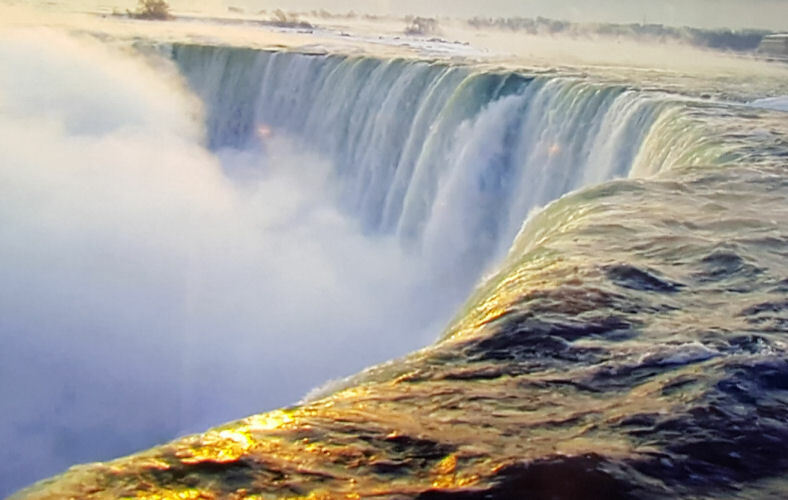 I have to say the Canadian Falls also known as the Horseshoe Falls are more spectacular than the American Falls. After checking out the falls we walked around the downtown area. There are two casinos, and plenty of restaurants, arcades, and other forms of entertainment if you need to warm up inside. We opted for heading back to the hotel for a swim in the pool before heading back out for the New Years celebration. 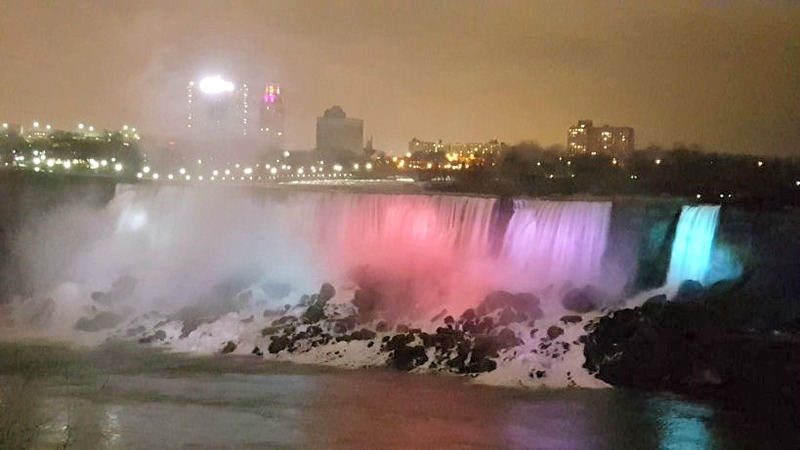 There were two fireworks shows scheduled for over the falls one at 9pm and one at midnight. In between there were several live bands playing outdoors adjacent to the falls. 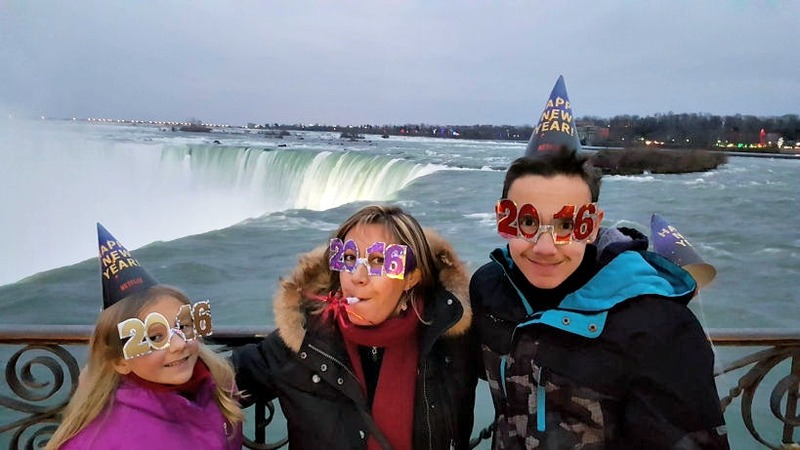 Happy New Year from Niagara Falls! We got dressed up in our warm clothes and headed out for a nice New Years Eve dinner in one of the local restaurants. After dinner we headed down to the falls again to catch the 9pm fireworks show. By this time the concerts were going strong and there were tons of people walking around. The firework show lasted about 4 minutes and was pretty exciting. 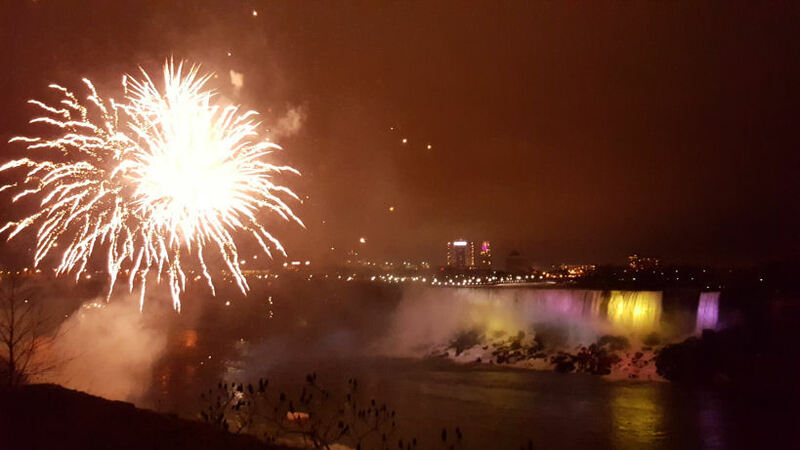 It was amazing to see the different colored pyrotechnics exploding in the sky with the falls in the background. After the fireworks show we decided to hang out in the hotel room and warm up for a couple of hours before the midnight show. As we were walking back to the hotel we could see tons of cars driving and people walking towards the falls. The feeling of excitement and anticipation was definitely in the air. Around 11:30 pm we headed back down towards the falls. The flow of people in cars and walking was now at a feverish pace. There was definitely much more excitement in the air as the crowds swelled when we approached the falls. The area cordoned off for the live concert was now completely full of people. We made a beeline towards the section closest to the falls. Fortunately we made it just in time for the New Years Eve countdown. The band led the countdown with everyone else joining in as well. When it reached zero everyone yelled out Happy New Year and the fireworks began exploding overhead. It was such an amazing site and it felt great to bring in the New Year with all of those people. After the fireworks ended we followed the mostly rambunctious crowd up the hilly street away from the falls. The crowd was loud and a bit feisty but under control. We eventually made it back to our hotel and eventually headed off to sleep. New Year’s Eve fireworks over Niagara Falls. They actually have 9 PM show and midnight show. Both Spectacular! The next day we ate breakfast again at The Flying Saucer diner and then headed over to the Embassy Suites Falls view to check into our room. The hotel check in was pretty crowded and we were excited to get up to our room. We were told our room was on the 41st floor (out of 42) and was ready. My husband told me that he booked a special room for us in advance so the kids and I were super excited. When we got up to the room we were not disappointed. 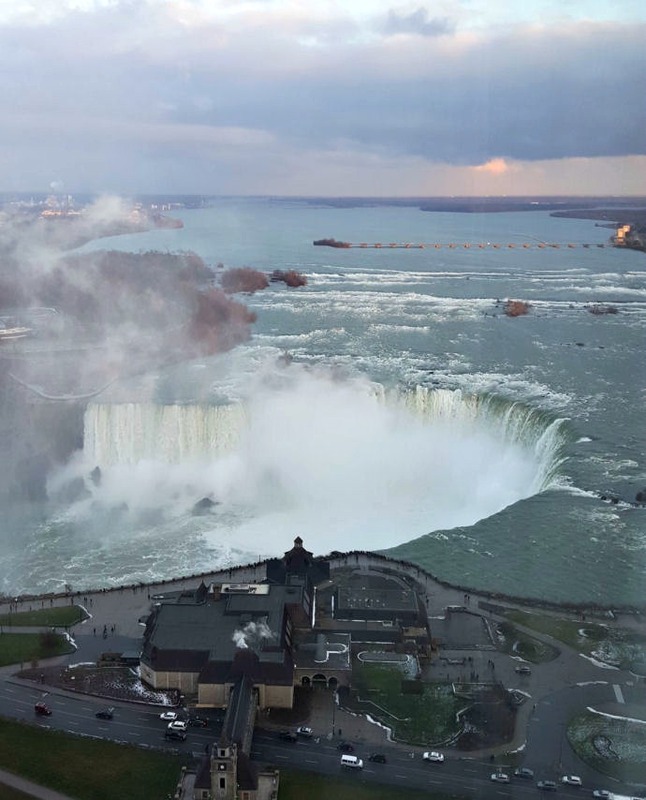 It was a two-room suite with Jacuzzi, two queen beds, a pullout sofa bed and an amazing view overlooking both the Canadian and American falls. I think we must have all stood there for about 10 minutes just staring down at the falls. One of the windows opened a bit also so we could hear the water rushing over the falls as well. My husband said that he booked this room directly through the Embassy Suites website and used his AAA discount to get a great nightly rate which included a hot buffet breakfast. We thoroughly enjoyed our stay at the Embassy Suites hotel Falls view. The pool on the 9th floor was spacious and had two large jetted hot tubs along side. There was also a nice view of the city from the pool area. The next morning was check out time but not before we enjoyed the hot breakfast buffet. Compared to our stay at the Ramada, the Embassy was definitely on a much higher level. Next time we come back to Niagara Falls we will definitely try our best to book the same room. 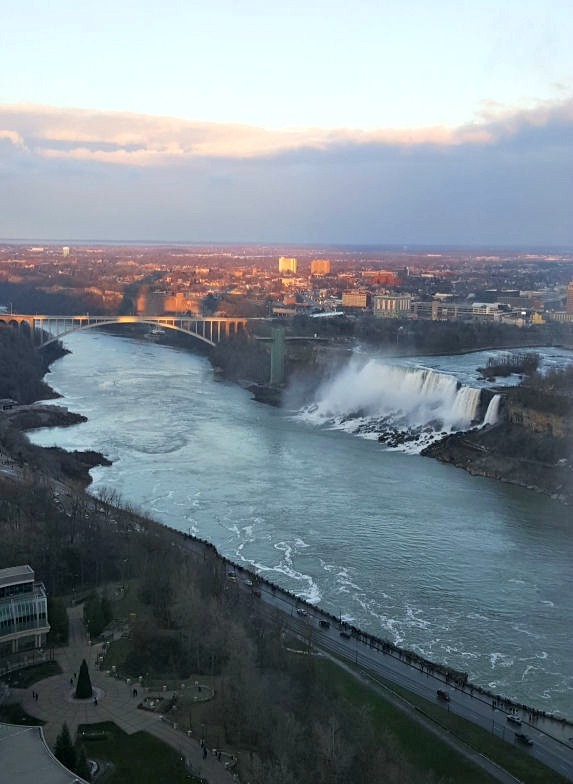 The accommodations and view made our last day at Niagara Falls a very special occasion. Thoroughly enjoyed reading this and loved the photos and video. Thanks Cheryl! Glad you enjoyed! We did, Liladyblogger! Thanks for your comment! Did you have a good NYE?